Classically named Ombos, Kom Ombo is the home of an unusual temple, unusual because it was dedicated to two Gods. As each of the two Gods have their own entrance, court, chamber, colonnade and sanctuay it creates the impression of two temples fused together. 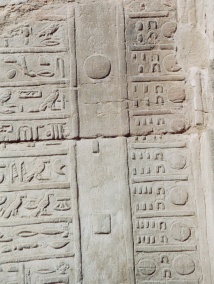 The west/left side of the temple is devoted to the falcon God Haroeris; "the solar war god" (sometimes known 'Horus the Elder', Harwe or Harer) and his wife Hathor-ta-sent-nefert (meaning good sister) and their son Panebtawy (Lord of the Two Lands). This Horus is believed to be different to the Horus who has the temple at Edfu dedicated to him. Whilst the eastern/right side of the temple, belongs to the crocodile god Sobek;"God of fertility and creator of the world", and his consort Hathor and their son Khonsu. Sobek was the crocodile god of Nile fertility. As the temple is located near an ancient habitat for Nile crocodiles, this may be the reason why the temple was devoted to Sobek. This is further supported by the collection of mummified crocodiles contained within the chapel of Hathor, in the temple at Kom Ombo. As can be seen from the photograph on the left the main entrance pylon has now been destroyed leaving only the foundations. The staircase in the court behind the pylon (which used to lead to a roof terrace) does not remain either. However the court does still contain a roman columned portico and the base of a central altar. The reliefs on the columns show emporer Tiberius making offerings to the gods. During processions the sacred bark was placed on the altar. The first Hypostyle hall (pronaos) is located after the northern part of the court. The doors on either side of the pronaos have columns next to them. These columns run in 3 transversal rows and are inscribed with icons symbolizing the 'two lands' of Egypt - lotus (for the south) and papyrus (for the north).The ceiling is illustrated with astronomical images and the walls contain Ptolemic Pharaohs offering the Gods. On either side of the pronaos doors are reliefs on the pronaos whalls depicting the purification of Ptolemy XII Neo Dionysos, Thot and Haroeris (on the left) and by Horus, Thot and Sobek on the right. After the chambers there is a sanctuary dedicated to Sobek and in the true spirit of the design of the rest of the temple there is also a sanctuary devoted to Horus. The sanctuaries themselves are in very poor condition, but the pedestals on which the gods' sacred barques would have rested still remain. Next to each sanctuary, there are rooms in which the cult statues of Sobek and Horus would once have been stored. The temple has a double corridor running around the entire temple, there are underground tunnels/crypts and hidden chamers. Some of these rooms were decorated including the enclosure wall at the rear of the temple. 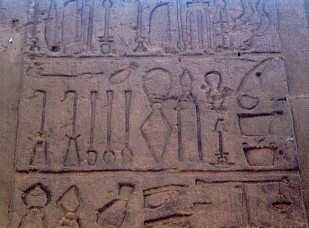 The reliefs on this wall have generated much interest as academics believe that the reliefs are depictions of surgical instruments (below) and supports the theory that ancient egyptians had achieved a high degree of skill in the field of medicine and that at some point the temple became a healing center. In addition to the medical instruments, some walls contain graffiti and crude drawings. Outside to the right of the temple, there is the chapel of Hathor and a roman birth house or mamissi. The chapel was built by Domitian in honor of Hathor because the Greeks identified her with Aphrodite. As mentioned above the chapel contains mummified crocodiles and their clay coffins. Although some academics believe that the site was a natural crocodile habitat others suggest that crocodiles were bred in a small pool on the western side of the temple. because the city was important for gold mines. If you have any time left during your tour of Kom Ombo, you may like to visit the remains of a deep well located just outside the left of the temple. Alternatively you could hunt for the false door, which has a niche carved into it. On the sides of this niche there are ears; if you find the door see if you can hear the prayers of the ancient egyptian worshippers through the ears. The ancient Egyptians believed that Sobek was the ally of the wicked god Seth. In the mythology Seth was the enemy of Horus and they were at war for 80 years. This war was vicious and included Seth tearing out Horus' left eye. Whilst Horus ripped out Seth's foreleg and testicles. The war ended with Horus' victory ( there are various versions of how this ocurred including Horus simply being deemed the victor by a council of the gods). Victory led to Horus becoming the ruler of the kingdoms of both Upper and Lower Egypt. Seth was castrated (or even killed in some accounts of the war) and forced to give Horus his eye back. Seth's allies escaped by transforming themselves into crocodiles. The Book of the Dead however describes Sobek as an ally of Horus. In this book Horus the Elder uses Sobek's help to kill Seth. Sobek also helped Horus on another occasion by saving Horus’ four sons from the waters of Nun.